The examples and perspective in this article or section might have an extensive bias or disproportional coverage towards one or more specific regions. Please improve this article or discuss the issue on the talk page. For the identifying tag worn by pets, see pet tag. 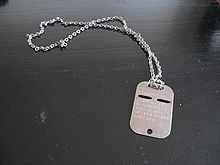 A dog tag is the informal name for the identification tags worn by military personnel, named such as it bears resemblance to actual dog tags. The tag is primarily used for the identification of dead and wounded along with providing religious preference and essential basic medical information for the treatment of the latter, such as blood type and history of inoculations. 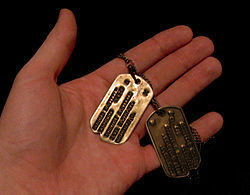 Dog tags are usually fabricated from a corrosion-resistant metal or alloy such as aluminum, monel or stainless-steel, although, during wartime, they have been made from whatever metals were available. In the US military, if the member has a medical condition that requires special attention, an additional, red tag with the pertinent information is issued and worn with the dog tags. During the American Civil War of 1861-1865, some soldiers pinned paper notes with their name and home address to the backs of their coats. Other soldiers stencilled identification on their knapsacks or scratched it in the soft lead backing of the Army belt buckle. Manufacturers of identification badges recognized a market and began advertising in periodicals. Their pins were usually shaped to suggest a branch of service and engraved with the soldier's name and unit. Machine-stamped tags were also made of brass or lead with a hole and usually had (on one side) an eagle or shield and such phrases as "War for the Union" or "Liberty, Union, and Equality". The other side had the soldier's name and unit and sometimes a list of battles in which he had participated. A New Yorker named John Kennedy wrote to the U.S. Army in 1862, offering to furnish discs for all officers and men in the Federal Army, enclosing a design for the disc. The National Archives now has the letter along with the reply, a summary refusal without explanation. 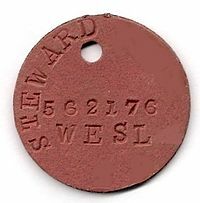 In the Spanish-American War, soldiers purchased crude stamped identification tags, sometimes with misleading information. The British Army and their Imperial forces in Canada, Australia and New Zealand issued identification tags from the beginning of the First World War. The tags were made of fibre, one in red and one in green, and suspended around the neck by butcher's twine. The same pattern was worn into the Second World War and the Korean War by Commonwealth forces. The Army changed regulations on July 6, 1916, so that all soldiers were issued two tags: one to stay with the body and the other to go to the person in charge of the burial for record-keeping purposes. In 1918, the Army adopted and allotted the serial number system, and name and serial numbers were ordered stamped on the identification tags of all enlisted troops. (Serial number 1 was assigned to enlisted man Arthur B. Crane of Chicago in the course of his fifth enlistment period.) In 1969, the Army began transitioning (servicemen were issued both a SSN and SN) to the Social Security number for personnel identification. Some nations (e.g., Germany) instead had a single tag with identical information stamped on both sides of it, which could easily be broken off for the purpose of record keeping. There is a recurring myth about the notch situated in one end of the dog tags issued to United States Army personnel during World War II. It was rumored that the notch's purpose was that, if a soldier found one of his comrades on the battlefield, he could take one tag to the commanding officer and stick the other between the teeth of the soldier to ensure that the tag would remain with the body and be identified. In reality, the notch was designed to hold the tag in place when being imprinted on the carbon-paper medical form by the Model 70 Addressograph (a pistol-type imprinting machine used by the Medical Department during World War II). The purpose and use of the notch was verified by a Snopes article, in which Snopes consulted with US Army Mortuary Affairs. As a side note, it appears instructions that would confirm the notch's mythical use were issued at least unofficially by the Graves Registration Service during the Vietnam War to Army troops headed overseas. Following World War II, the US Navy Department adopted the dog tags used by the US Army and Air Force, so a single shape and size became the American standard. In the Vietnam War, American soldiers were allowed to place rubber silencers on their dog tags so the enemy would not hear the metallic clanking. Others chose to tape the two tags together with black tape. Still others chose to wear one tag around the neck and the other tag on the lace of one boot. All three variations were commonly seen among U.S. troops. Dog tags are traditionally part of the makeshift battlefield memorials soldiers created for their fallen comrades. The casualty's rifle with bayonet affixed is stood vertically atop the empty boots, with the helmet over the stock of the rifle. The dog tags hang from the rifle's handle or trigger guard. Dog tags have recently found their way into youth fashion by way of military chic. Originally worn as a part of a military uniform by youths wishing to present a tough or militaristic image, dog tags have since seeped out into wider fashion circles. They may be inscribed with a person's details, their beliefs or tastes, a favorite quote, or may bear the name or logo of a band or performer. Some people also prefer to have the information on their tags transferred to a smaller, sometimes golden or silver tag by a jeweler, as the original tag can be considered too large and bulky by some. Some are also used for health problems, such as heart problems or epilepsy. Since the late 1990s, custom dog tags have become fashionable amongst musicians (particularly rappers), and as a marketing giveaway item. Numerous companies offer customers the opportunity to create their own personalized dog tags with their own photos, logos, and text. Even high end jewelers such as Cartier and Tiffany have featured gold and silver dog tags encrusted with diamonds and other jewels. The Austrian "Bundesheer" utilized a single long, rectangular tag with oval ends, stamped with blood group & Rh factor at the end, with ID number underneath. Two slots & a hole stamped beneath the number allow the tag to be broken in half, and the long bottom portion has both the ID number and a series of holes which allow sthe tag to be inserted into a dosimeter. This has been replaced with a more conventional, wider & rounded rectangle which can still be halved, but lacks the dosimeter reading holes. The information is printed exactly the same on both discs. In the event of a casualty, the circular tag is removed from the body and the octagonal tag is placed inside the dead soldier’s mouth, between the teeth and lips. Canadian Forces ID Disk. Name, rank, and service number are redacted. Lower half: identical, except it does not contain the blood type, and the reverse is blank. On the right hand side of the tag it says Danmark, the Danish word for "Denmark". The Nationale Volksarmee used a tag nearly identical with that used by both the Wehrmacht and the (West) German Bundeswehr. The oval aluminum tag was stamped "DDR" (Deutsche Demokratische Republik) above the personal ID number; this information was repeated on the bottom half, which was intended to be broken off in case of death. Oddly, the tag was not worn, but required to be kept in a plastic sleeve in the back of the WDA identity booklet. Finnish dog tags are also designed to be broken in two; however, the only text on it is the personal identification number and the letters SF, which stands for Suomi Finland, within a tower stamped atop of the upper half. Not all corps in the Greek forces are given ID tags (for example, soldiers in the engineer corps are not issued tags, while those in the Infantry and Artillery are). In case of capture, Israeli soldiers are instructed to provide the information that appears on the dog tag and their rank only. Another dog tag is kept inside the military boot in order to identify dead soldiers. Originally the IDF issued two circular aluminum tags (1948 - late 1950s) stamped in 3 lines with Serial number, Family Name, and First Name. The tags were threaded together through a single hole onto a cord worn around the neck. The first dog tags were issued in Poland following the order of the General Staff of December 12, 1920. The earliest design (dubbed kapala in Polish, more properly called "kapsel legitymacyjny" or "ID cap") consisted of a tin-made 30×50 mm rectangular frame and a rectangular cap fitting into the frame. Soldiers' details were filled in a small ID card placed inside the frame, as well as on the inside of the frame itself. 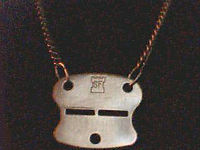 The dog tag was similar to the tags used by the Austro-Hungarian Army during World War I. In case the soldier died, the frame was left with his body, while the lid was returned to his unit together with a note on his death. The ID card was handed over to the chaplain or the rabbi. The former Republic of Rhodesia used two WW2 British-style compressed asbestos fiber tags, a No. 1 octagonal (green) tag and a No. 2 circular (red) tag, stamped with identical information. The red tag was supposedly fireproof and the green tag rotproof. The following information was stamped on the tags: Number, Name, Initials, & Religion; Blood Type was stamped on reverse. The Air Force & BSAP often stamped their service on the reverse side above the blood group. Russian Armed Forces use dog tags with only "ВС РОССИИ" (Russian: Russian Armed Forces) and the unique serviceman ID on it. Each soldier receives two identical dog tags, issued by either the military commissariat or his home station. 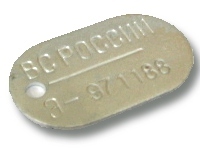 Before the dissolution of the Soviet Union, the Red Army used dog tags similar to modern Russian ones, but with "ВС СССР" (Russian: USSR Armed Forces) engraved upon them. When a soldier is killed in action, the round piece is removed by cutting the short loop with a bayonet, while the oval piece remains with the body. 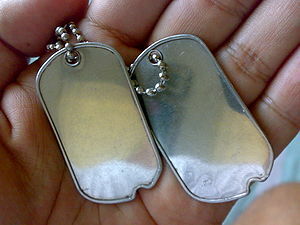 The former South African Defense Force used two long, rectangular aluminum tags with oval ends, stamped with Serial Number, Name and Initials, and Religion. The South Korean army issues two long, rectangular tags with oval ends, stamped (in Korean letters) with "Ryuk Gun" ("Army") above personal number, with name below that and blood group at bottom. All information is repeated on the bottom half of the tag, which is to be broken off and returned to the unit in case of death or injury in combat. The dog tags during the Cold War were issued to everyone, often soon after birth. However in the late 90s the Swedish government decided that the dog tags were not needed anymore, most probably because of the Cold War had ended. The blood type is generally not stamped on the dog tags as it may change (rare) and that, in combat situations, they give standard blood (type 0) and, in hospitals, it is easier to check the blood than the tag. The UK Armed Forces utilize two circular stainless steel tags embossed with the "Big 6": Blood Group; Service Number; Surname; Initials; 2-letter Religious code (e.g. CE for Church of England, RC for Catholic, OD for Other Denomination, etc. ); & Force (e.g. RN, Army, or RAF). One tag is suspended 6 inches (150 mm) below main tag. Recently, the U.S. Army stopped using the term dog tags, replacing it with ID tags. A persistent rumor is that Debossed (imprinted with stamped in letters) dog tags were issued from world war two till the end of the Vietnam war and that currently the U.S. military is issuing embossed (imprinted with raised letters) Dog tags. The truth is that, The United States Military issues dog tags with both types of imprinting, depending on the machine used at a given facility. the military issued 95% of their identification tags up until recently (within the past 10 years) with debossed text. During World War II, a dog tag could indicate only one of three religions through the inclusion of one letter: "P" for Protestant, "C" for Catholic, or "H" for Jewish (from the word, "Hebrew"), or (according to at least one source) "NO" to indicate no religious preference. Army regulations (606-5) soon included X and Y in addition to P,C, and H: the X indicating any religion not included in the first three, and the Y indicating either no religion or a choice not to list religion. By the time of the Vietnam War, IDs spelled out the broad religious choices such as PROTESTANT and CATHOLIC, rather than using initials, and also began to show individual denominations such as "METHODIST" or "BAPTIST." Tags did vary by service, however, such as the use of "CATH," not "CATHOLIC" on some Navy tags. For those with no religious affiliation and those who chose not to list an affiliation, either the space for religion was left blank or the words "NO PREFERENCE" or "NO RELIGIOUS PREF" were included. Although military personnel today can list any religion on their ID tags (and can also purchase commercially made tags as long as they conform to military specifications), the Military Association of Atheists and Freethinkers (MAAF) calls the regulations pertaining to religion on ID tags "an immediate and constant source of discrimination in the military for many soldiers." MAAF has recommended that "religion" be changed to "funeral preference," indicating the choice of official burial practices that are available to them using government funds, and that special requests be indicated on the ID tag by including the word "will," to indicate that the will should be consulted for details. Ironically, although the ID tags include religion as a way of ensuring that religious needs will be met, some personnel have them reissued without religious affiliation listed -- or keep two sets, one with the designation and one without -- out of fear that identification as a member of a particular religion could increase the danger to their welfare or their lives if they fell into enemy hands. Some Jewish personnel avoided flying over German lines during WWII with ID tags that indicated their religion, and some Jewish personnel avoid the religious designation today out of concern that they could be captured by extremists who are anti-semitic. Additionally, when American troops were first sent to Saudi Arabia during the Gulf War there were allegations that some U.S. military authorities were pressuring Jewish military personnel to avoid listing their religions on their ID tags. 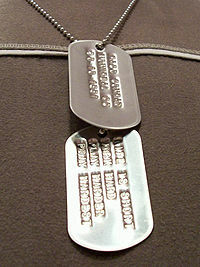 Standard US military dog tags are issued with one 2.5 mm, 24-inch neck chain and one 2.5 mm, 4-inch duplicate chain. The secondary chain and duplicate tag are recovered if needed. The primary chain and tag remain with the soldier at all times. Ball chain may be upgraded to 3 mm diameter by individual soldiers. Chains smaller than 2.5 mm and larger than 3 mm are not generally authorized due to the risk of breakage/loss or inability to recover the duplicate tag from larger chains. Dog tag ball chains were once thought to have been clipped to length to help captured soldiers count time in the event they were captured. The large chain was counted to 365 ball links, and the small chain was counted to 52 ball links. A soldier could then bite or break off one link from the large chain each day and remove one link from the small chain each week. This accounted for one year of time before the cycle consumed the chain completely. No verified comparison between the standard 24" and 4" chain lengths and number of "beads" per length has been performed. The typical length of 365/52 however, is adequate for mounting and wearing standard I.D. tags. This however is not true as a U.S. Air Force 210 bead chain is 27.5" long (which hangs in the middle of ones chest). A 365 bead chain is approximately 47.25", which hangs down too far on the average person. ^ a b "AFI 36-3103". 1 May 1997. http://www.e-publishing.af.mil/shared/media/epubs/AFI36-3103.pdf. ^ www.militarydogtags.com, retrieved May 30, 2011. ^ a b militaryatheists.org, retrieved May 30, 2011. ^ www.ajcarchives, pages 178-179, retrieved May 30, 2011. This page was last modified on 7 July 2011 at 07:53.